State weather bureau reported early Monday, October 7, 2013, that Bagyong Ramil has slightly intensified but will not affect our country. PAGASA weather bulletin as of 4 a.m., Bagyong Ramil was located 910 kilometers northeast of Itbayat, Batanes. It continues to move in the northwest direction over the Philippine Sea. PAGASA estimated the rainfall amount is from 7.5 - 15 mm per hour (heavy - intense) within the 550 km diameter of the Typhoon Ramil. 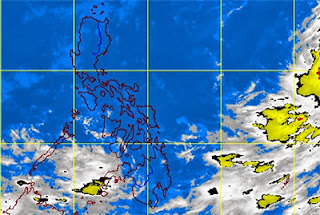 The rest of our country specially in Metro Manila will be partly cloudy to cloudy with isolated rains and thunderstorms. PAGASA said, rains and thunderstorms mostly in the afternoon or evening. For the meantime, please bookmark this page now or visit this site more often for you to be updated. You may also share this post to your friends so they may know about the Bagyong Ramil Update. Comments or suggestions about "Bagyong Ramil Update as of October 2013 by PAGASA" is important to us, you may share it by using the comment box below.